Anita Bryant is a pop singer who had several big hits during the late ‘50s and early ‘60s and made several successful albums, becoming best-known for her 1960 US Top 10 hits “Paper Roses” and “My Little Corner of the World”. She found fame as a beauty queen before starting to make records, and after her chart career waned in later years attracted attention as a controversial political and social activist. 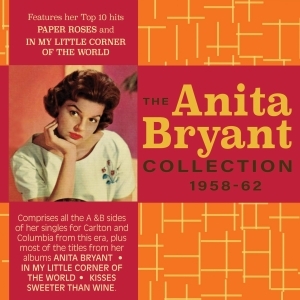 This great-value 56-track 2-CD set comprises the A & B sides of all her singles for the Carlton and Columbia labels during this era, along with most of the titles from her Carlton and Columbia albums “Anita Bryant”, “In My Little Corner Of The World” and “Kisses Sweeter Than Wine”, which mainly comprised interpretations of well-known standards. It includes “Paper Roses” and “My Little Corner of the World” along with her ten other Billboard chart entries from this era, notably her Top 30 1959 debut with “Till There Was You” and the later Top 20 hit “Wonderland By Night”. She was a singer who typified a particular strand of mainstream pop in the era before the British invasion had its cataclysmic impact a couple of years later, but who also explored a more sophisticated pop style on her albums.